It was another great day at the LA Times Hero Complex Film Festival as today's lineup started with a screening of 1996's Independence Day. I remember seeing this as a teen and owning a VHS copy complete with groovy hologram cover. The last time I tried to watch it was several years ago as a drinking game. Ya know, every time someone says "Mr. President" or Jeff Goldblum's character's failed marriage is mentioned, take a drink. Trust me, it ain't easy. Once again, moderator and host extraordinaire Gina McIntyre let us know they had a couple treats in store for us. With writer/director Roland Emmerich (Universal Soldier, Stargate (Van Damme AND Kurt Russell alert as I saw them both in the last week. Full circle. Rambo reference # 225)) scheduled to speak I figured they'd show us a little something from his upcoming White House Down. We were also informed that former writing partner Dean Devlin would be joining us as well. 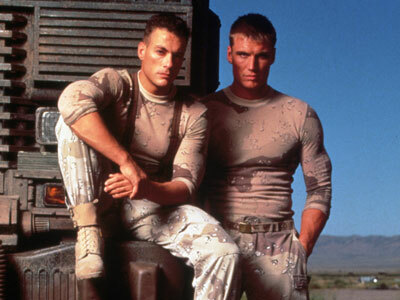 Seriously, the duo's work on Universal Soldier, Stargate, Independence Day and The Patriot had influenced my formative years something fierce . The 90's were just 2 sweeeeet! The lights went down and the 20th Century Fox fanfare filled the theater. Watching ID4 again was great, it has that soothing, cold and smoky 90's cinematic look and feel to it. I was surprised at how well it holds up; the characters are built up and memorable from Bill Pullman's steadfast President to Jeff Goldblum's eccentric yet brilliant communications expert to Will Smith's cocky Marine pilot to Randy Quaid's drunk, abducted by aliens and returned to Earth father/crop duster. There's humor, emotion, excitement and of course, a mess of destruction! The special effects still look great with their mix of practical gags, miniatures, matte paintings and computer generated images. I thought it might play a little cheesy with a bit of eye rolling but no, you're in it to win it. The emotional beats grab you and the action scenes excite you. What can I say? It's still a bombastic, rousing, crowd pleasing disaster meets alien invasion flick that doesn't pummel you with spectacle while ignoring story and characters. Did I mention how much I miss the 90's? After the credits rolled, a what I think was new trailer for White House Down played. It contained a little more build up and much more humor than what I had seen already. Most of the scenes showcased stars Channing Tatum and Jamie Foxx. If it's half the action-buddy comedy/invasion yarn the trailer makes it out to be, we're all in for a good time at the movies. The kind of time when you feel copacetic with paying the freight and not cheated you got some low budget, supposed to be clever genre flick (cough, Zombieland, cough). Joining sirs Emmerich and Devlin was none other than star of the movie, Jeff Goldblum! It was a very informative affair and the trio were joined by a member of the effects crew whose name escapes me. - ID4 came from a meeting Emmerich had with Warner Brothers who wanted him to direct an "escape from prison" movie with Harrison Ford. He politely asked the budget and was told it was $75 million. Emmerich was flabbergasted that a simple prison movie would cost that much. - Writing and producing partner Dean Devlin was skeptical of the idea but Emmerich sold Devlin on the scope in his mind, saying that if you looked up in the sky, the space ship would take up all of it. - Ashamed to admit the script only took 3 weeks to write. - Put it up auction style with a script and set budget. - Write with actors in mind, nodding to Mr. Goldblum who mentions how good White House Down looks and how he is a fan of WHD co-star Maggie Gyllenhaal. - Shot in 70 some days and across several neighboring sound stages. - The way Emmerich and Devlin work is that they sit on opposite sides of a long table with Devlin doing a pass of a scene while Emmerich sketches out his ideas. - This way they roughly had the entire movie storyboarded. - Goldblum described the set as always moving but not in a frantic, Emergency Room kind of way. - Enjoyed E/D's working style as they would continue rolling after scene was over to let the actor's add anything they wanted. - One of Emmerich's most memorable moments on set came from actor Robert Loggia being concerned the movie was a spoof and nobody told him. Devlin said they were trying to make Airport but said Airplane. - Built up the characters and didn't have an explosion right away because they had studied many 70's disaster movies where you always got to know the players before the carnage started. - Devlin directed much of the aerial footage and they employed old school techniques like using models on sticks and having the background on a wheel to create illusion of movement. - ID4's main competition was Warner Brothers' Mars Attacks from Tim Burton. They had already started production but part of the auction agreement was that ID4 be released on July 4th, a month ahead of Mars. Even though they're different movies, Hollywood lumps types together. - Leads to talk of White House Down in comparison to Olympus Has Fallen. While cast was coming together for WHD, Emmerich was told no director was attached to OHF, all of a sudden they had a director and were going to start shooting in 5 weeks. - First audience question was mine, asked what memories they had of making Universal Soldier and working with young Jean-Claude Van Damme and Dolph Lundgren. - Emmerich says it came about because he quit the Sylvester Stallone lead project Isobar after 9 months of prep. Studio/financier head Mario Kassar was impressed with his decision and offered him Universal Soldier which had already been in heavy pre-production. - Emmerich told Kassar he wanted to keep the general concept and two actors involved but throw away the rest. Kassar said yes but they had to bring it in under $20 million even though studio had already spent $7 million on it. - Only fond memories of Unisol, was great for him and Devlin and launched their careers. Some slick homeboy with an accent was on the verge of pitching them something but luckily, Mrs. McIntyre shut him down. As always, lots and lots more was talked about but I think I've told you enough. It was a lot of fun seeing ID4 up on the big screen and the panel afterwards was fantastic. See ya next year, Hero Complex! Until then check out this awesomely bad trailer that by today's standards nearly looks fan made.